A study conducted in North India found that people with low levels of antioxidants had higher levels of cataracts.1 A meta-analysis in 2015 found that too little vitamin E increased the risk of developing cataracts.2 Diabetes and fluctuations in blood sugar levels are risk factors for cataracts. Cataracts are the leading cause of total blindness in the world. Whether you have access to cataract surgery or not, prevention is better than disease. Scientists have studied specific nutrients and their links to cataract formation. What can you do to help prevent cataracts? Which fruits, vegetables, and other foods reduce cataract risk? If you have already developed cataract, can you do anything? Most cataracts occur in seniors. The eye’s lens becomes cloudy. Once a cataract starts to form, it grows larger, thicker, and stiffer over time. Eventually, the cataract is developed enough for a recommendation by your eye doctor for surgery. The eye surgeon replaces the cloudy lens with an artificial lens. The new lens will not form cataracts. The new lens may correct refractive vision problems, reducing the need for glasses. However, sometimes a “post cataract” develops when leftover debris settles on the new lens. This issue is easily resolved by an in-office laser treatment. Cataract symptoms include glare sensitivity (particularly at night), halos, and blurriness. You may gradually notice difficulty reading, dull colors, and trouble reading low-contrast text. The world may start to look like a fog has fallen. Eventually, cataracts become debilitating. The end is an advanced or ripe cataract. A ripe cataract can result in total blockage of light entering the eye, effectively causing blindness. Some babies are born with cataracts. Children and teenagers might develop cataracts if they have retinitis pigmentosa, for example. Most cases occur after age 45. Cataracts in middle-aged and senior people are likely caused by long-term sun exposure, lens oxidization, and poor circulation, and lack of essential antioxidants needed for optimum eye health. Cataracts in adults form over years and decades. The sooner you address lifestyle and nutrition habits that lead to cataracts, the sooner you can head off this eye condition. What does the research show? As you age, risk factors pile up. Many of these factors are cumulative. At Natural Eye Care, Inc., we believe that cataracts are usually a symptom of metabolic imbalance. The circulation of nutrients into and out of the eye has been compromised. Restoring balance in the body and providing sufficient eye nutrients should thus reduce age-related eye disease. The eyes need high levels of nutrients. Eyes are the second most physiologically active part of the body. Only the brain is more physiologically active. Tiny ocular structures are vulnerable to attacks from free radicals. Therefore, antioxidants are vital to fighting age-related eye disease, including cataracts. A growing body of research is showing how lifestyle affects eye disease, and why. Several recent studies have shown antioxidants are important in fighting macular degeneration. We are now learning how important these same antioxidants may be for preventing cataracts as well. Dherani M, Murthy GV, Gupta SK, et al. Blood levels of vitamin C, carotenoids and retinol are inversely associated with cataract in a North Indian population. Invest Ophthalmol Vis Sci 2008;49(8):3328-35. In this study 1,112 participants aged 50 or older were interviewed for risk factors (tobacco, alcohol, biomass fuel use, sunlight exposure, and socioeconomic status) and underwent lens photography and blood sampling to measure antioxidant levels. Researchers found significant inverse associations between cataracts and the antioxidants vitamin C, zeaxanthin, lutein, lycopene, alpha- and beta-carotene and beta-cryptoxanthin. People with lower levels of these antioxidants had higher rates of cataracts. Zhang, Y., Jiang, W., Xie, Z, Wu, W., Zhang, D. (2015). Vitamin E and risk of age-related cataract: a meta-analysis. Public Health Nutr, Oct;18(15):2804-14. Vitamin E is a well-known free-radical fighter. The researchers analyzed 64 published studies on vitamin E. The studies covered Vitamin E intake from food and supplements. Some also took bloodwork into account. The metanalysis found that high levels of Vitamin E were associated with a significantly decreased risk of developing cataracts. Ferrigno, L., Aldigeri, R., Rosmini, F., Sperduto, R.D., Maraini, G., et al. (2005). Associations between plasma levels of vitamins and cataract in the Italian-American Clinical Trial of Nutritional Supplements and Age-Related Cataract (CTNS): CTNS Report #2. Ophthalmic Epidemiol, Apr;12(2):71-80. A group of 1020 study participants had either early cataract or no sign of cataract. They were aged 55 to 75. The researchers examined the amount of antioxidant Vitamin C in the blood. They also measured red blood cell glutathione reductase activity. High Vitamin C levels had a protective effect on two common locations for cataracts (nuclear and posterior subcapsular). The body makes glutathione, but you can supplement it if desired. This nutrient helps Vitamin C work correctly in the body. In the lens, this combination may help prevent protein clumping that precedes cataracts. An oral spray form of glutathione is more absorbable than a tablet. Other essential nutrients include lutein, zeaxanthin, and bilberry. How can you boost your antioxidant levels? Eat more fruits and vegetables, especially those high in yellow, orange and dark green pigments. The Mediterranean Diet is rich in eye-protecting nutrients. However, seniors have lower calorie needs and less efficient absorption. Many need supplements to protect their eyes. Fruits and vegetables are also high in soluble fiber. Soluble fiber helps slow down your body’s absorption of carbohydrates. Wild swings in blood sugar and chronically elevated blood sugar can harm your eyes. Diabetic retinopathy and diabetic cataracts are common problems. Even if you have not been diagnosed with diabetes, keep your blood sugar levels stable. The best foods for blood sugar are medium or low on the Glycemic Index. Kato, S., Shiokawa, A., Fukushima, H., Numaga, J., Kitano, S., et al. (2001). Glycemic control and lens transparency in patients with type 1 diabetes mellitus. Am J Ophthalmol, 131:301–304. This small study found young adults with juvenile diabetes had lenses that were less clear than their healthy peers. Incidence of cataract surgery in the Wisconsin Epidemiologic Study of Diabetic Retinopathy. Klein BE, Klein R, Moss SE Am J Ophthalmol. 1995 Mar; 119(3):295-300. 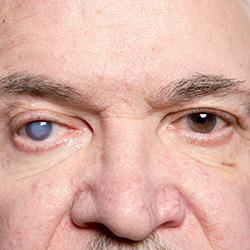 Diabetic patients were two to five times more likely to get cataracts. Fisetin is an antioxidant found in foods such as cucumbers, apples, onions, and strawberries. The body manufactures α-lipoic acid. It is prevalent in broccoli, potatoes, spinach, and some other foods. Researchers fed α-lipoic acid and fisetin to rodents; then they induced cataracts. Both had a protective effect on cataract progression. α-lipoic acid is favored by diabetic patients for its effects on nerve damage. Oclumed eyedrops contain l-glutathione, cysteine ascorbate (vitamin C), taurine, n-acetyl-carnosine, n-acetyl-cysteine and riboflavin. Research supports that nutrition and supplements can help prevent cataracts from forming. Antioxidants appear to have an impact on the process of cataract formation. Since blood sugar appears to play a role in cataracts, diabetic patients should pay careful attention. Up Next: See our Advanced Lens Support Package and learn more about Cataracts.